Pleasant Mattress recently sponsored a “capture the flag pillow fight” during Sleep Awareness Week. The event was coordinated by Tobias La Ponza, resident adviser at Fresno State University, to give students a chance to relieve stress during the exam season. Pleasant Mattress donated 150 pillows for students to use in the battle. This creative allowed Pleasant Mattress President and CEO, Rion Morgenstern, to bring attention to sleep awareness at Fresno State in a fun and unique way. As a premier mattress manufacturer, we understand the importance of a restful night’s sleep, and how important sleep is to your overall health. Transforming the sleep of our customers is our goal with every mattress we make. The National Sleep Foundation’s Sleep Awareness Week, March 10-16, highlights the importance of good sleep health for overall well-being. This year's theme “Begin with Sleep” highlights the importance of good sleep health for individuals to best achieve their personal, family, and professional goals. College students are one of the most sleep-deprived groups because of studies, and social activities, that interfere with a consistent sleep schedule. Tobias reached out to Pleasant Mattress after several students asked him to start a pillow fight program. Resident Advisers create two programs every month with the goal of getting residents interacting with each other. These monthly programs teach students skills such as team-building, strategy, and healthy physical habits. Tobias knew this pillow fight fit the bill as an activity for students to run around and forget about exams for a bit. The Pleasant Mattress team is committed to giving back to our community. 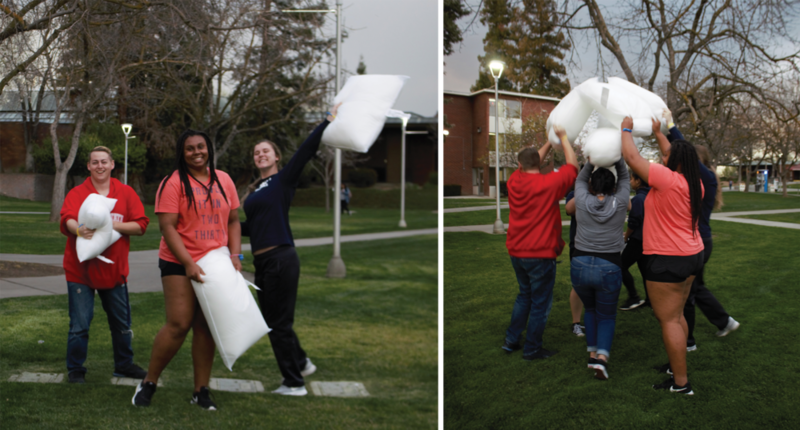 The pillow fight offered a unique opportunity to give back to the Fresno State community for a fun and original event, while celebrating the importance of Sleep Awareness Week. Keep an eye out in the Fall for our Friends and Family event to benefit an amazing non-profit organization in Fresno. Images courtesy of Karli Toone.